A short drive east from San Juan on coastal route 187 is the beach town of Piñones. Freed and escaped sugarcane plantation slaves founded Piñones with the help of native Tainos, and Afro-Carribbean culture and pride still run strong. At my first roadside stop, I watched a bomba dancer in a long skirt and bare feet command the rhythms of conga drummers with the movement of her hips. 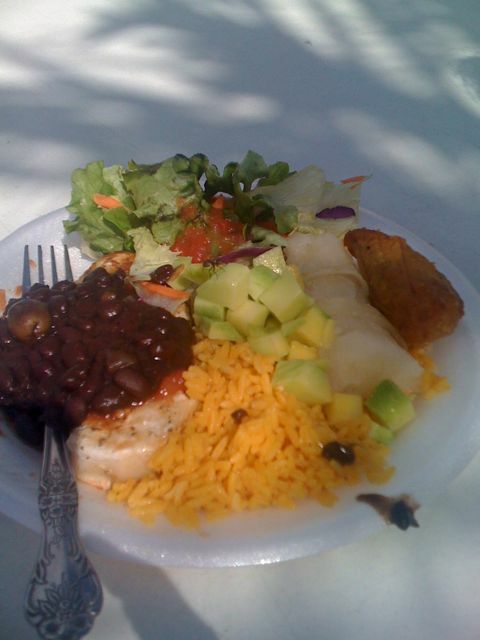 This is my plate at Jean’s family gathering in Miami, at his uncle’s house. He is Puerto Rican and his wife is Tranidadian so it is REAL!! Yellow rice, grilled fish with pepper sauce, yuca, fried plantain, green mango,and salad! The best curry I ever had was made of fish heads. It was with Jean, two years ago, at the Banana Leaf in the Little India section of Singapore. I liked this place a lot. For one thing, we ate off of banana leaves instead of plates. And instead of utensils, we followed local custom and used our hands to eat. We started off messy, but then copied a group of businessmen seated nearby, using our fingers to roll compact balls of curry-sopped rice. I felt like a child learning to use a fork for the first time, and that was big fun. Notice, in the above picture, the small pile of bones on the corner of Jean’s leaf. In the USA, fish heads are what we throw away. But they are so meaty! I heard somewhere that the most tender flesh in the fish is at the back of the “scull,” and it is true. Like soup cooked with bone-in, skin-on, fatty chicken vs. soup cooked with cubes of white breast meat, fish head curry is ten times more flavorful than any other fish I’ve ever tried. I lived around cities my whole life, where food came from the supermarket, from restaurants, or machines. We had an aversion to the whole animal approach to food. Gizzards, eyeballs, bones and blood were considered “dirty” food. We only used the breast of the chicken, the filet of the fish, and the ‘mignon’ of beef: the cutest cuts for the most proper presentation. But now, with the whole “snout to tail” (or is it tail to snout?) philosophy gaining popularity, we are reaching back into the theoretical garbage can to reclaim lost treasures. Marrow bones have become a menu must. A new cookbook features bacon fat cookies. Headcheese is on the rise. On my first day at a new job, the chef made summer rolls with leftover crispy duck skin…they were to die for. So, city or country; trend or tradition; Stateside or Singapore; have your fish– and eat it, too. Quakertown is one of those Pennsylvania towns where Victorian style houses with wraparound porches line both sides of Main Street. Where every other storefront is an antique shop. Where a railroad crossing sign marks the main intersection. On the left, there’s a perfectly preserved, turn of the century train station, where a white haired man and woman, silhouetted against the sun, are huddled in conversation- although it looks like a train hasn’t passed through here in decades. Basically, it’s the idyllic little toy land from the intro to Mr. Rogers’ Neighborhood. And it has always given me the creeps.